At first it was a bit annoying when I went into a shoot with a preconceived idea of what I wanted and others would make suggestions. Of course, there is a time you need to have a focus on a specific look and idea for a client. But if you are shooting for the fun of seeing what you can do and honing your skills, this is what I've found makes a great deal of difference in the outcome. A photo shoot isn't a good place to be shy. If you have an idea, speak up. And no, not all of your or anyones ideas will be used, but often even a lacking idea sparks a thread of thought that creates better ideas. I often let the makeup artist and hair stylist chat with the model and see what they have always wanted to try. If they come up with an idea everyone is happy with we head in that direction. 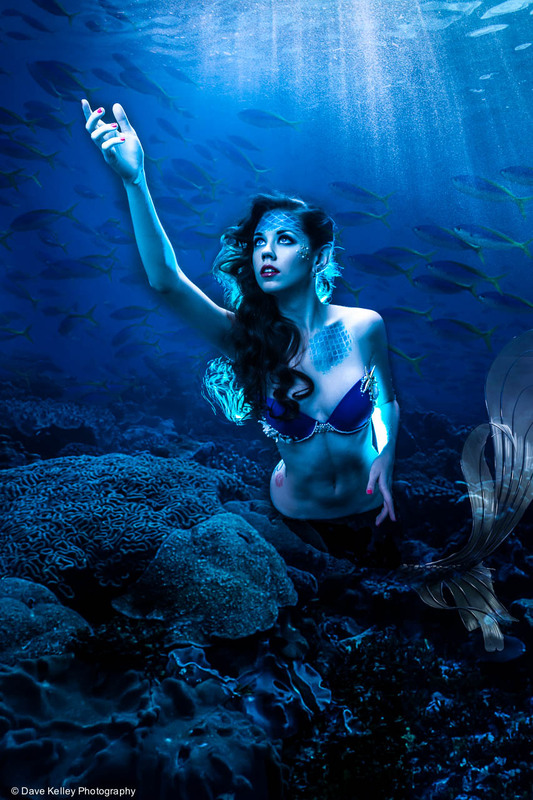 For example, this mermaid shoot wasn't something I would have actually considered. I'd shot for 4 years and avoided the seemingly required 'mermaid' shoot but they wanted to do it and I figured it was a good place to get creative. So sure. It became a lighting challenge where I had to envision the final scene. My creativity contribution. This, for me, was a LOT of fun even though the model had to take my word for it. Trust is good. So, with some communications the ideas flowed. Everyone was creative in their own way. The makeup artist, Erika, brought bras with shells and pearls glued to them and did some neat little scale type patterns on Katrina, the model. While they were doing makeup I started digging around in the prop room looking for things we could use and found a net hammock that worked just fine. And, of course, Katrina did some wonderful under water type poses with my explanations of how she will be in the water with light from above. All three Cs were using full steam in this shoot. In the pirate example above Rebecca and Raygan, her mother, collaborated with Rubii, the makeup artist/hair stylist and came up with the idea of a ship in her hair. I had the ship! So, we made it happen and it came out wonderful. Another very creative day indeed. Looking over any very creative shoot I've done it was full of communication between all involved and that lead to energetic collaboration in every aspect. Everything from hair and makeup to lighting to props to what music we listen to while we create. Then again, it's those three Cs that set the mood and it becomes fun and creates the energy in the shoot. And the energy is very important.